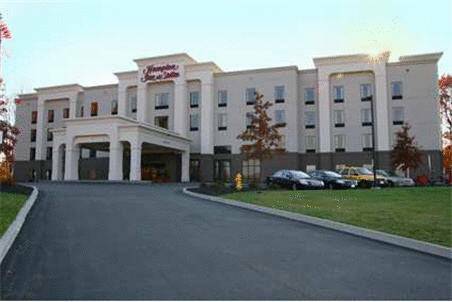 The Hampton Inn and Suites Jamestown NY hotel is located just off New York Interstate 86 on the north side of Jamestown. Our convenient location offers many spectacular breathtaking views and amenities for your relaxation as well as great attractions such as The Lucille Ball-Desi Arnaz Center Roger Tory Peterson Institute of Natural History and the Jamestown Saving Bank Ice Arena. Only minutes away from our hotel guests will find great year-round events happening in Jamestown New York. Our hotel offers the best in accommodations and service. When you make the Hampton Inn - Suites Jamestown your next stop we will make sure you are satisfied. We love having you here in New York at the Hampton Inn - Suites Jamestown hotel. ~30 miles from New York. ~41 miles from New York. Cabooses permanently parked along some old tracks provide a novel sleeping experience, if you haven't been to America's other caboose motels. ~68 miles from New York.